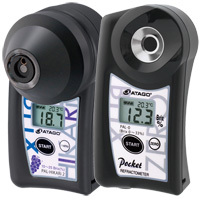 IR Brix Meter PAL-HIKARi | ATAGO CO.,LTD. The Brix (sugar level) can be measured by placing the fruit on the sample stage with no need of cutting or squeezing. It requires no more cumbersome wiping and cleansing after each measurement. All it takes is to put it against a fruit so each individual fruits' brix (sugar level) can be inspected. The measured fruits are intact and can then be shipped and sold after measurement. Fruits that were measured then can be shipped and sold thereupon. The light source is employed with LED chips. With optic design the way in which the light is directed at the fruit.The way in which the light is directed at the fruit is well optic designed made it possible for no other like compact and low price.No other like compact and low price instrument was made possible with well thoughtout optic design that allows the light that is directed to the fruit. Well thoughtout optic design shines light to the fruit just right, making it possible for no other like instrument that is compact and low pricedIts portability and affordability allows the unit to be available for individual consumers. Available for anyone to use with ease of portability and affordability that individual customers can use. 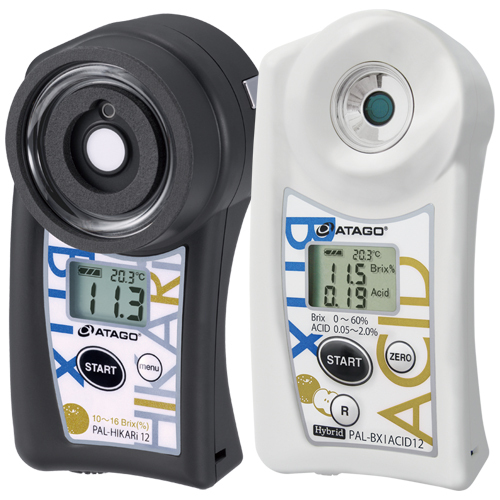 All ATAGO products are designed, manufactured, and undergo thorough quality assurance testing in our own factory in Japan. We guarantee safe, reliable, high-quality products and services to our customers. The warranty period for the PAL-HIKARi is 1 year. In the event that any servicing or repair is required, please contact ATAGO. Place the instrument against the fruit or place the fruit on the instrument. Measurement will display with just a press of a button. The buzzer alarm that relay measurement completion or error makes it easy to tell if it is taking the measurement. Equipt with backlight, taking measurements in dark places are possible. Besides aforementioned, pâtissier chefs who uses fruits as an ingredient, gardening hobbyist that enjoys home gardening and may more can be use it. 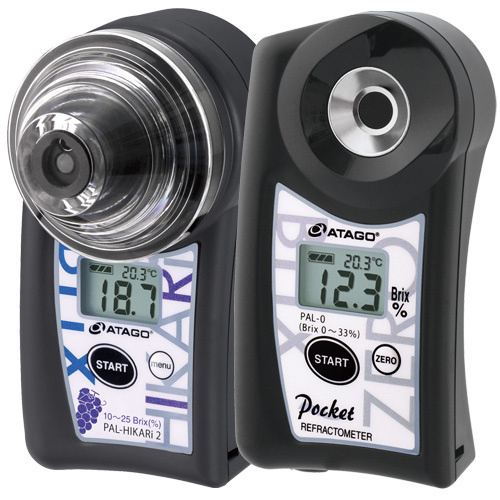 by pressing it against the fruit and Brix meter that can measure the sugar content by placing some squeezed fruit juice is now available. Special scales are available for each fruits. Choose the combo set of your choice. 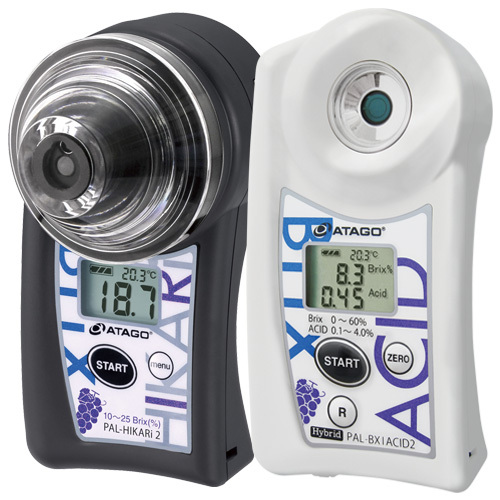 a Brix acidity meter that can measure the sugar content by placing some squeezed fruit juice is now available. 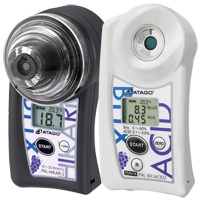 It requires no more cumbersome wiping and cleansing after each measurement. 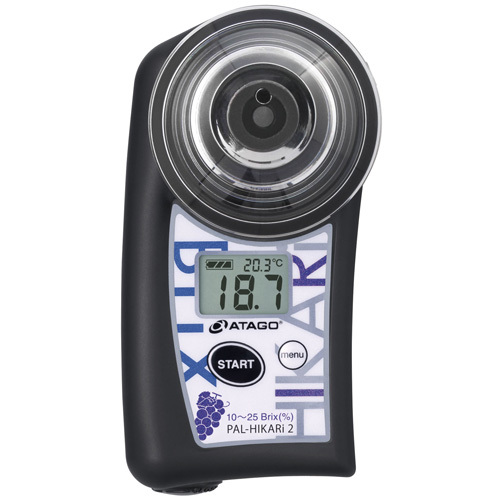 The Brix (sugar level) can be measured by placing the fruit on the sample stage with no need of cutting or squeezing.It requires no more cumbersome wiping and cleansing after each measurement. *Peach varieties and measurement environment may affect accuracy. *Pear varieties and measurement environment may affect accuracy. Now available as a bundle set of "PAL-HIKARi" non-destructive Brix meter that can measure Brix of fruits and "PAL-0" which measures Brix of squeezed fruits juice.The following specification is for "PAL-0." See PAL-HIKARi2's specification here. 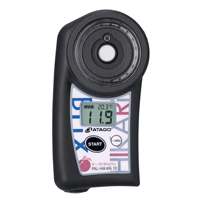 *PAL-0 is only available for IR Brix Meter × Brix Meter. It cannot be purchased separately. 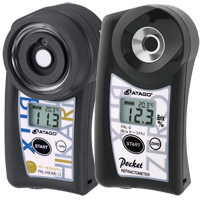 Now available as a bundle set of "PAL-HIKARi" non-destructive Brix meter that can measure Brix of fruits and "PAL-0" which measures Brix of squeezed fruits juice.The following specification is for "PAL-0." See PAL-HIKARi5's specification here. Now available as a bundle set of "PAL-HIKARi" non-destructive Brix meter that can measure Brix of fruits and "PAL-0" which measures Brix of squeezed fruits juice.The following specification is for "PAL-0." See PAL-HIKARi 10's specification here. Now available as a bundle set of "PAL-HIKARi" non-destructive Brix meter that can measure Brix of fruits and "PAL-0" which measures Brix of squeezed fruits juice. The following specification is for "PAL-0." See PAL-HIKARi 12's specification here. Now available as a	bundle of "PAL-HIKARi" non-destructive Brix meter that can measure Brix of fruits and "PAL-BX/ACID" which measures Brix and acidity of squeezed fruit juice.